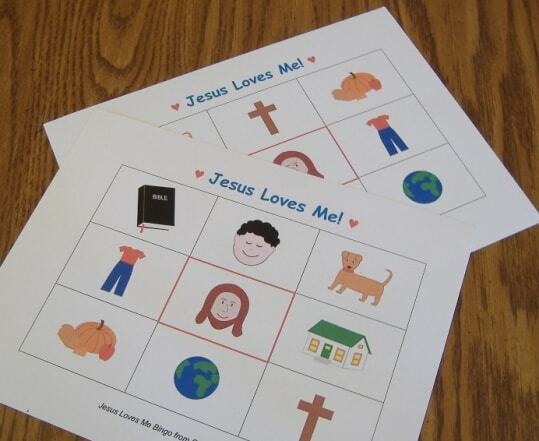 Jesus Loves Me Bingo reminds children of the ways God shows his love for us. It could be used near Valentine’s Day or any time you are emphasizing God’s love. The 3×3 cards (where you have to get 3 in a row) would work well for kindergarten and above. 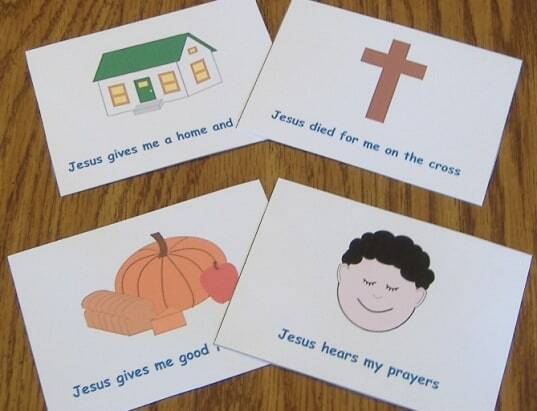 The 2×2 cards (where you have to mark all 4 pictures) would work well for kindergarten and below. 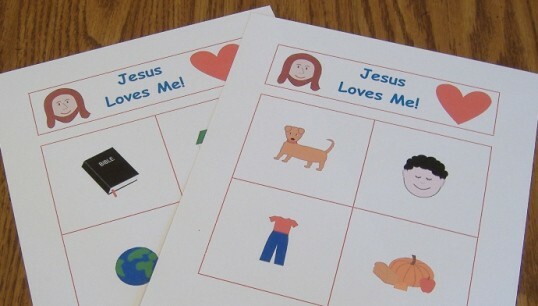 Print out the 3×3 cards (PDF) or 2×2 cards (PDF), as many as you need, on cardstock or heavy paper. Print out the calling cards (PDF) on cardstock or heavy paper. Cut colored paper or cardboard into small squares to use as markers, or provide other markers. Give each player a card and a handful of markers. Have each player start by placing a marker on Jesus in the center square. The leader draws a calling card, reads the statement, and holds the card up for everyone to see. Each player places a marker on the matching square on his/her card. The winner is the first person to get three markers in a row horizontally, vertically, or diagonally. The winner is the first person to mark all four squares on his/her card. Thank you so much for offering these for free!! Our kindergarteners-2nd graders will love playing this! I loooveee this!! I’m from Brazil and my kids will love playing too, I will go translate for use!